With over 10 years experience in the Wedding cake industry, I know how stressful planning a wedding can be. Choosing your wedding cake is easy,I offer flexible hours as well as evening appointments to accommodate busy life styles. Located in North Fitzroy, you can view my display cakes and portfolio at your convenience whilst sampling the delicious range of sample cakes available. I pride myself on a personal and professional approach and ensure all my cakes are individually perfect for the big occasion. My range of cake boxes and bags are perfect for creating your own stylish packaging for your guests to take home. 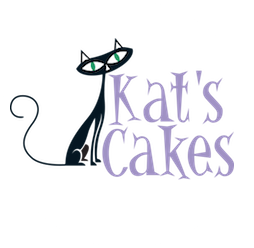 Kats Cakes offer a delicious range of cake flavours and fillings. I can also cater for some dietary specific cakes including gluten free, egg free and lactose intolerances. However, due the nature of these cakes and those cakes with creams or custards, there are artistic limitations in design. A lot of time and work goes into preparing, baking and decorating my cakes. Wedding Cakes are especially fragile so it is extremely important that when transporting your cake, it is kept flat as possible. I offer a delivery and set up service for all Speciality Cakes to ensure they arrive safely. You are also most welcome however to collect your cake. I recommend putting the boxed cake on the floor of the vehicle, definitely not on the back seat! If you have left over wedding cake or want to keep your top tier, I recommend wrapping your cake in glad wrap then placing it in an air tight container in the freezer. This is to make sure that the cake is kept at a constant temperature and will be as fresh as possible when enjoying at a later date. All these cakes are custom made and can be designed in a range of delicious flavours. Plaques, candles, cake boxes and delivery are also available to make organising your celebration cake easy.